Otis’s first hit was a 1946 big band version of Harlem Nocturne, a moody number featuring a film-noirish saxophone. Here’s a YouTube recording. 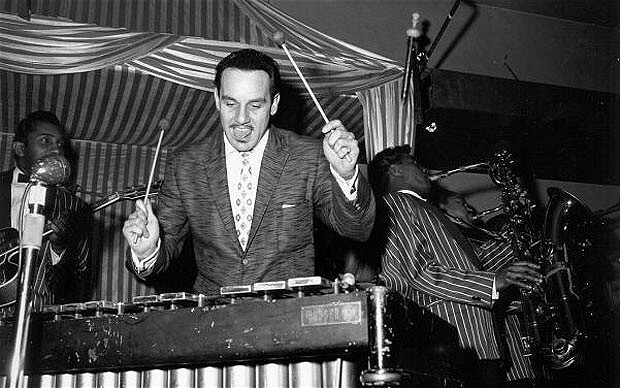 The drummer/vibist was a big fan of the Basie sound, but discovered, like so many other big band leaders, that the market wasn’t supporting sixteen piece bands after World War II. He pared down the band, added electric guitar, hired some singers, and became a leading proponent of a new type of music – rhythm and blues. Along the way he discovered an amazing number of performers, often through talent shows at the Barrelhouse Club. 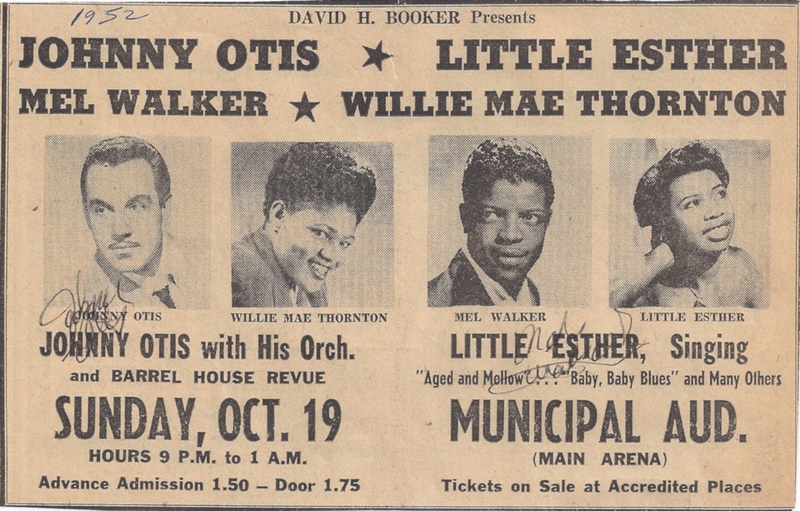 Artists like the Robins (who morphed into The Coasters), Esther Phillips, Big Mama Thornton, Big Jay McNeely, Etta James (who also passed away last week), and others owe a large part of their careers to working with Otis. Otis was also a songwriter, with a number of hits on the R&B charts of the early 50s, including Every Beat of My Heart, which was originally recorded by the Royals (who became the Midnighters), and was later recorded by Gladys Knight and the Pips. His biggest hit was Willie and the Hand Jive the throbbing 1958 rock & roller. Here he is performing the tune on his TV show. Otis was inducted into the Rock and Roll Hall of Fame in 1994 as a producer and songwriter. I was lucky enough to see Otis twice. The first time was at the Ann Arbor Blues & Jazz Festival in 1973, where his revue included Cleanhead Vinson and the great Joe Turner. Even from a far-off vantage point, his delight in showcasing the musicians was evident. In 1984, he brought the Johnny Otis Show to Wilebski’s Blues Saloon in Saint Paul, where I was able to get a short interview with him before doing my radio show later that night. LE: How did you come up with the idea of presenting a revue, with a number of different acts? JO: I was always impressed with the variety show method of presenting acts. That is like at the big Orpheum theater with a girl singer, and then a vocal group and a tumbling act. I liked that because of its variety. And then the minstrel shows had a lot of fun, and a lot of blues and a lot of boogie, and a lot of comedy. And when I got in a position, I got my first hit record, I said I’m gonna try that, cause I have a feeling that the public likes that, and I did it in a blues context, a blues jazz context. LE: That first hit, was that was Harlem Nocturne? LE: Didn’t you have some of Count Basie’s people playing on the session? JO: Basie was always paternal, and he knew how much I loved him and he always helped me. He gave me arrangements out of his book. He loaned me his men, like Preston (ed note: Preston Love, alto sax) and I were childhood buddies but he was playing with Basie at the time. Eli Robinson, the trombone player. Jimmy Rushing, the singer, he loaned them to me to make a record date. But you know I though all those elements were going to make me a hit, and they didn’t have a damn thing to do with it. It was Harlem Nocturne that made the hit. LE: Wasn’t that was something that you had to pull out of the air, because you had extra time? JO: You know, it was my first record date, and when we finished the three sides I had prepared I said, Hey, Rene (ed note: Otis Rene, label owner) we’re through and we have twenty whole minutes left. He said, “Wait a minute, what do ya mean.” I said we did three sides in quicker than four hours. He said, “No, it’s four sides in three hours, so hurry and get out there and do something else.” So we had that in the book, and we recorded it and it was just a happy accident. LE: Your R&B revue has served as a proving ground for a lot of young artists and a lot of people who’ve become stars. How did you find the folks that you used in the revue? JO: Oh, Little Esther (Phillips) I found in my back yard in Watts. I was the Chicken Man, and she used to come and help me catch chickens. One day we were laying under a tree sipping some lemonade, after she’d caught the chicken sfor me, and she started singing. It just shocked me, so I took her to my club, The Barrelhouse, that night, and she won first prize, and I wrote a song, we went to the studio and recorded it and she became a hit. Etta James I found, my manager called me one afternoon. We were in San Francisco and he said there’s a girl down here wants to sing for you. I told him “Tell her to come tonight.” She grabbed the phone and said (imitating her), “I want to sing for you now.” She came up to the room with two other young ladies, and she sang and it was so pretty I took her home with me and we recorded Roll With Me Henry, it became Dance With Me Henry and was a great hit. And then one afternoon in Detroit we did a talent show at the Paradise Theater, and during that show I found Jackie Wilson, Little Willie John, and the Midnighters (See previous post for a Hank Ballard interview), and a lot of other marvelous acts, but you couldn’t record them all. Big Mama Thornton I found in Texas, and Ernestine Anderson I found in Los Angeles, and Linda Hopkins I found in Oakland, California. I, I remember them pretty well right now, because we’re about to do a big reunion, a Johnny Otis Reunion at the Monterrey Jazz Festival this month, on the fifteenth. I had all these people signed and sadly, Esther Phillips and Big Mama Thornton both passed away. They won’t be with us, but all the rest of the people will be there. LE: So you’re just continuing the process of keeping the traditions alive and finding new talent. JO: I was involuntarily retired for ten years, because the music died out. That is, the music will never die out. The demand, the commercial demand for it dried up. And then, about a year and a half ago, it got good again, so we all got together, and we’re all traveling, and I’m really thankful to be back in the game. LE: I’m aware, personally, I’m a little bit younger, of three, rather four phases in your career, I guess now. One was the hit of Willie and the Hand Jive. LE: And then there was the series of albums that you’ve done with people such as Big Joe Turner and Louis Jordan. LE: How did that come about? JO: Well, I had a recording studio. I had just built a fine studio. In fact, Columbia built it for me, and I thought, “Look at my old partners, living here in LA, and nobody’s recording them.” So we made records and I’d supply them with records and they go out and sell them on their gigs. You know, records keep you alive, and it was thrilling for me to word with Cleanhead Vinson and all those great men. LE: Well, it’s good to see you back recording again and on the road again. This entry was posted on Tuesday, January 24th, 2012 at 10:35 am and is filed under Interviews. You can follow any responses to this entry through the RSS 2.0 feed. You can leave a response, or trackback from your own site.